You can make and receive calls on Samsung Galaxy Tab tablet. You need to subscribe to mobile / cellular service and get SIM (Subscriber Identity Module) card for the same. SIM card holds your subscription details, such as your personal identification number (PIN) and optional services. Further, to use UMTS or HSDPA services you can purchase a Universal Subscriber Identity Module (USIM) card. You can easily insert SIM card in Galaxy Tab to get going with making calls. 1. Open the cover of the SIM card slot on the right side of the device. 2. Then insert the SIM or USIM card. 3. Now place SIM or USIM card into the device with the gold-coloured contacts facing down. 4. Then close the cover of the SIM card slot. Please note, do not insert memory card in this (SIM) card slot. 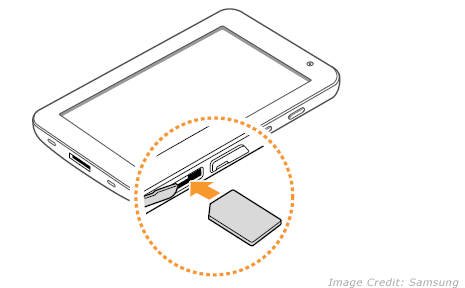 There is separate slot of install optional memory card in Samsung Galaxy Tab tablet. Pls how do I insert a sim in my Samsung tab 10.1? I can’t find the sim slot. i want to buy one tablet, but i have gone through the comment, little bit confession, so kindly advice me to purchase a tablet. “Insert A SIM Card”…plz help!! I am trying to install SIM card in Samsaung Glaxy tab 7. However,it is saying that there’s no service eventhough I inserted correctly. If someone knows or experienced before, help me. Well, have you tried to turn on the flight mode then turn it off again? I had the same problem like yours, then i did it, and it worked for mine. can i use a uk card with my galaxy tab in the summer? so is there any action that i can make if i want to use simcard even my samsung tab doesn’t have sim card holder? They did the same to me and i returned it. Sprint devices canot be unlocked as they use a different platform. With a Sprint tablet all you can use it for is wifi.